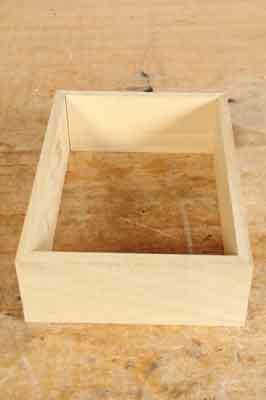 By its very nature your scrap box is bound to contain a lot of small offcuts, and here is a project that needs only a small amount of timber and a piece of plywood. It is a small key cupboard, though obviously it could be used to store other things, too. 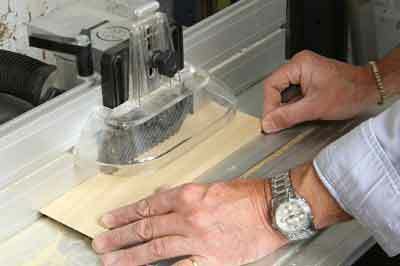 Its construction involves a fair amount of routing, and to make the panelled door you will need a dedicated cutter set. However, it is all pretty straightforward. 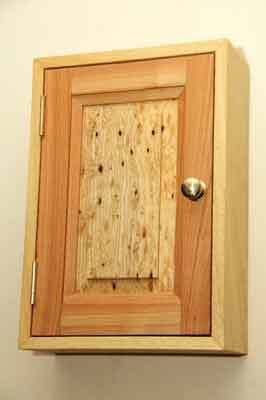 Use any timbers that you have and, ideally, try to find an attractively figured piece for the door panel which contrasts with the frame. 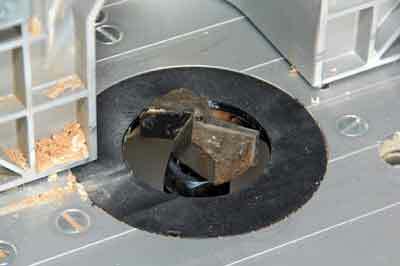 You will need some suitable offcuts for the project, similar to these shown here. When cutting up small offcuts, a bandsaw is useful as its thin blade wastes less timber than a tablesaw, leaving more for you to work with. 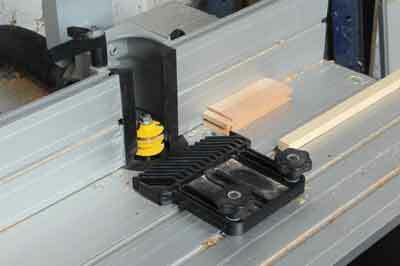 You can now plane and thickness your timber to suit. This piece of cherry (Prunus spp.) will become the door frame. The cupboard frame is simply made from four boards jointed with mitres. 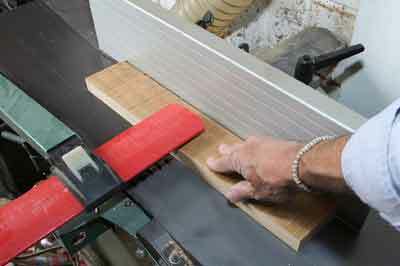 Set your tablesaw or mitre saw to 45° and cut to length. The completed sides should look like these. 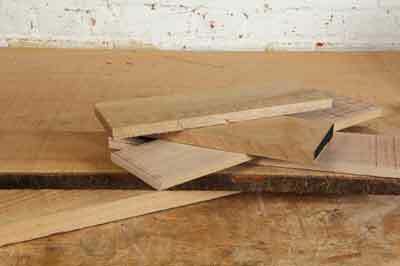 The cupboard back is a piece of ply that is held in a groove cut into the sides. 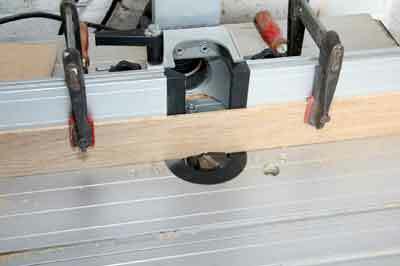 4mm thick ply was used here, so fit the router table with a 4mm diameter straight cutter. Set the fence about 6mm back and set the cutter depth to 4mm. 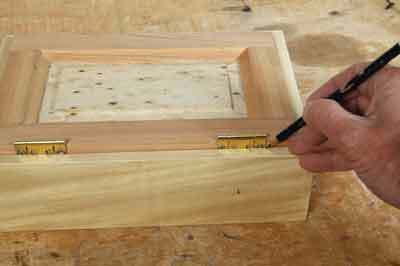 Carefully rout the groove on the inside face of each of the sides. You can then cut a piece of ply to fit. The frame can now be assembled. 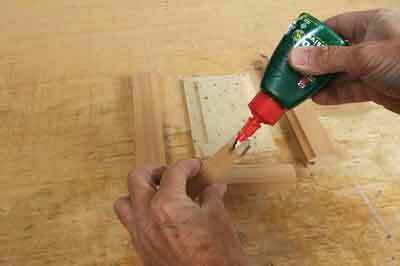 Apply a little glue to each of the joints and you can also run some glue into the groove for the back. You can now fit the parts together. 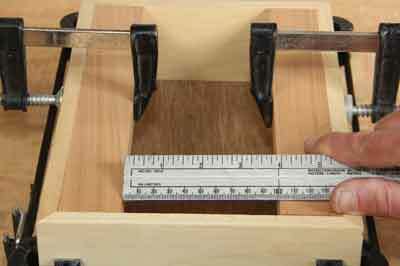 Support the frame with a frame clamp and ensure that the assembly is square by measuring the diagonals to confirm that they match. The next job is to make the door. 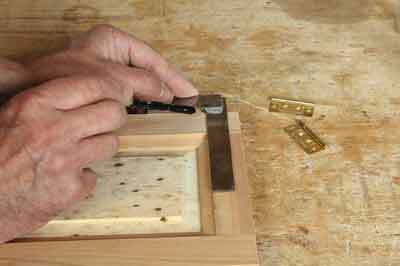 Use the assembled frame to mark off the length of the stiles. Cut the stiles to length; they should be a tight fit at this stage. 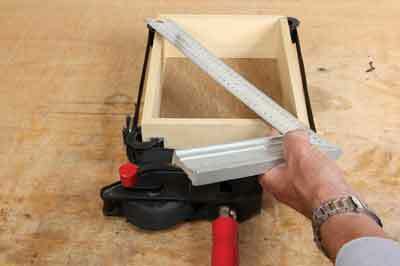 Clamp them in position and measure the gap between them to gauge the length of the rails. Remember that you will need to allow extra length for the joints. 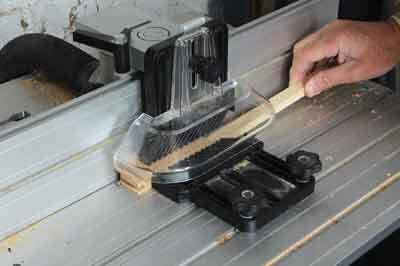 A combination rail and stile moulding cutter is ideal for this job. It cuts a joint 9.5mm deep. So you can round this up to 10mm and therefore add 20mm to the length of your rails. 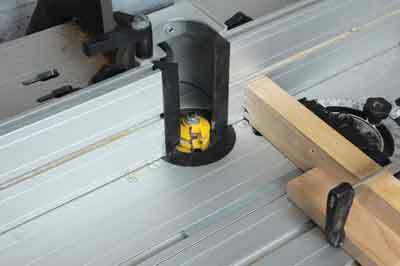 Install your cutter in the router table and set it according to the manufacturer's instructions. Normally you cut the joints on the ends of the rails first. In this case the rails are very short, so set up a mitre guide with a sacrificial support board at the rear and then clamp a stop block to it to hold the rail up against the cutter. Now cut the joints on both ends of the rails. 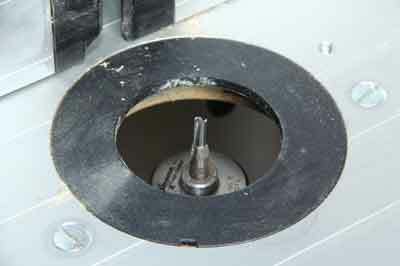 The cutter must be re-set to cut the grooves in the door frame. 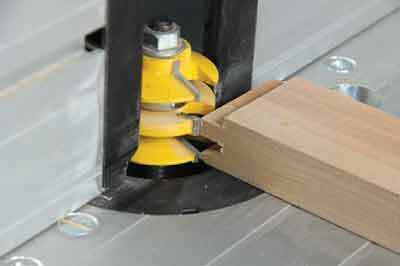 Use the rail joint to line up the cutter, then make a test cut using a piece of scrap to make sure that the settings are correct. Again, the short rails need to be treated carefully. 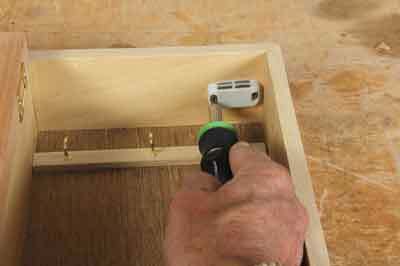 Fit a featherboard to the router table so that the workpiece is held tightly against the fence and also cut a length of scrap to use as a push stick. 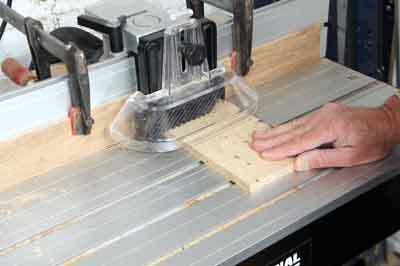 Fix the relevant cutter guards, start the router, and using the push stick, guide the two short rails past the cutter. Repeat with the stiles. 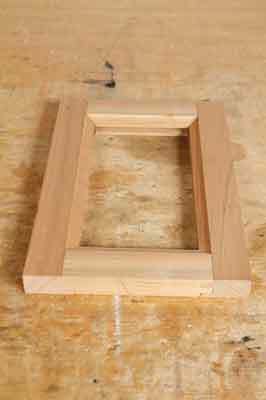 At this stage, the finished frame should look like this. Try to find an interesting piece for the panel. 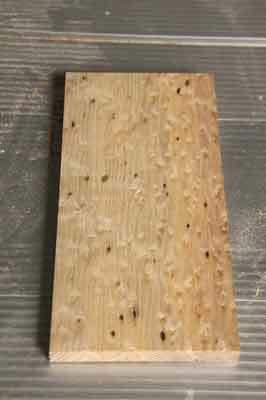 This is bird's eye maple (Acer saccharum). You now need to cut it to the correct dimensions to fit the door frame. 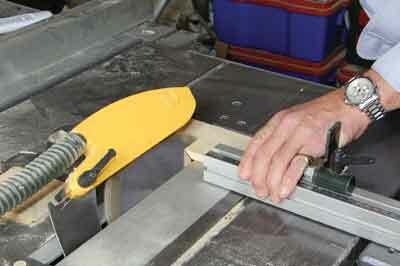 Use a panel raising cutter to mould the edge of the panel so that it fits the groove in the door frame. Some of these cutters have a bearing to guide the workpiece. This one does not, which can cause problems, especially with small panels. Clamp a false fence onto the main fence and raise the cutter to bite into it. 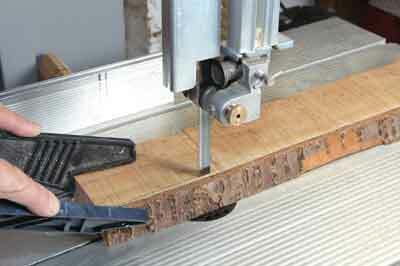 When moulding panels, you must take a number of shallow passes until you reach the desired thickness. 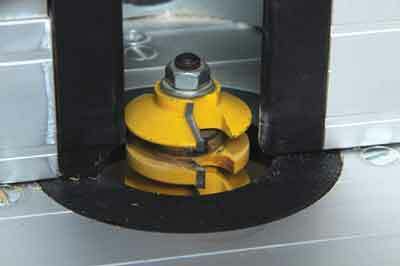 Test the fit in one of the stiles after each pass until you get a perfect fit. 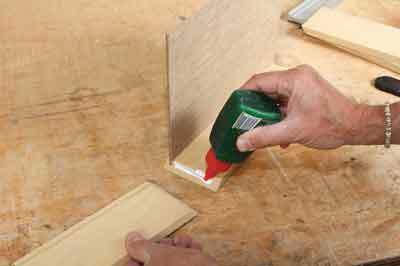 To assemble, apply glue to the joints on the end of the rails. Be careful not to get any glue onto the panel or in its groove. Clamp it up and leave to dry. Because the back of the cupboard is rather thin, fit a pair of battens across it to hold the key hooks. Cut them to length, glue in position and then screw the hooks in. Mark the position of the hinges on the door. Line them up with the edge of the frame moulding. Mark the hole positions. 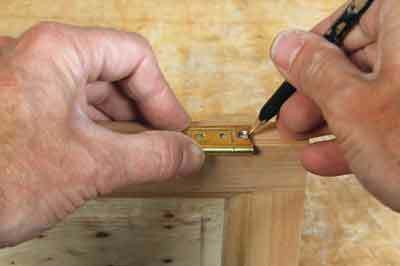 Use flush hinges as they don't need to be recessed into the door or frame. 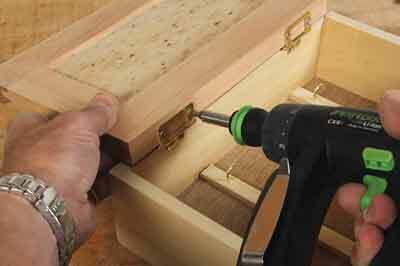 Drill pilot holes and fit the hinges with one screw each. 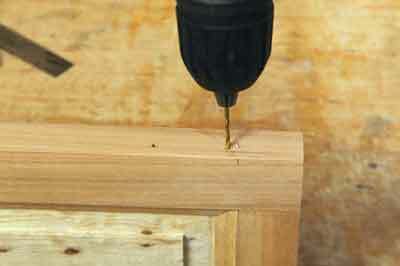 Place the door in the cupboard frame and mark the hinge positions. Adjust the fit of the door with a plane if necessary. Screw the hinges in position, again with one screw and check the fit. Make any adjustments and finally install all the screws. Fit some kind of catch to hold the door shut and fit a suitable handle. You can turn or buy one. 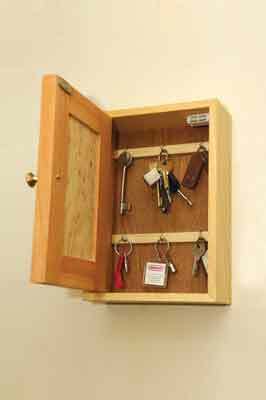 The completed key cupboard. Now simply apply some oil or lacquer and it is ready for use.